If you have kids, you probably understand the toy struggle. Kids always want the new and exciting toys, sometimes unwilling to play with their older toys. If you have too many toys and are wondering what to do with used toys, consider selling, donating or storing them. Store Used Toys: Toys have sentimental memories. Instead of throwing them out, store them for the future generations. 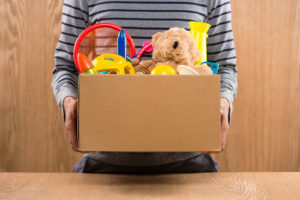 If you or someone you know is planning on having kids later on, consider storing your used toys. Storing toys is an environmentally friendly way to get the toys, and the clutter, out of your house. Also, depending on the cost and kind of toy, storing your toys for later on, as opposed to throwing them out, will save you a great deal of money. If you are planning on storing toys for a long period of time, or are storing expensive electronic or wooden toys, consider a climate controlled storage unit. Over time, the Georgia summer heat may wreak havoc! Donate Used Toys: Kids need toys. Toys spark creativity and growth. Instead of throwing out old toys, consider donating used toys to a charity. Charities looking to help kids will give your used toys to kids in orphanages, foster care, or even just to families who can’t afford to buy toys. Donating items can also be written off on your taxes, provided that it’s a qualifying charity and you kept your receipts. Donating toys can also be a valuable lesson to kids, teaching them to be selfless whenever possible to help others. Sell Used Toys: If your child has too many toys, consider selling the toys to make room and money to buy new toys. Have your kids help set up a garage sale and tell them they can use whatever money they make from the sale to buy new toys. This will not only help to declutter your home, as an added bonus it will also help teach your kids learn financial responsibility. If You Aren’t Ready to Donate Used Toys Quite Yet, Store Them! If you are storing your toys for a long period of time, or are storing electronics or electrical toys, consider utilizing a climate controlled storage unit. Fluctuations in temperature can cause toys to rust, ruining the toy. Storage World has three locations in Georgia ready to help you with your storage needs. Contact us today!